When two Finnish backpackers get some work as “bar girls” in a remote mining town, they are unaware of the culture shock they are about to experience. Hotel Coolgardie is an observational documentary showing this clash of cultures, that is at times hilarious and at others deeply disturbing. With this Western Australian filmed documentary opening this week, DAVID O’CONNELL had a talk with director Pete Gleeson about his “fly on the wall” view of this remote rural pub. Consequently the proprietor knew who he was when he called about filming the change-over of bar girls. For Gleeson this was an opportunity to explore an interesting push/pull dynamic somewhere between exploitation and opportunity. “It was a convenient transaction from both sides. Especially in mining areas where the publicans need labour, but the locals prefer the money of the mining industry. 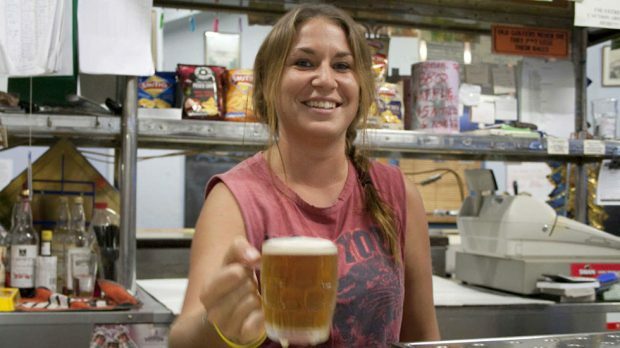 So you have holidaymakers looking for an authentic outback experience, and publicans looking for workers.” However Hotel Coolgardie portrays a very different experience to the sanitised view from films such as Crocodile Dundee, as the back-packers quickly discover. Gleeson sees that as part of the beauty of observational documentary as a style. “It allows you to go into an established cultural microcosm and observe all these things that are normalised by that. When it’s projected outside of that would you get to deconstruct it. See all the things that are extreme, or unusual or funny because of that. Speaks to the mechanics of culture in general.